So here is an invention that is really helpful for all those tiny apartment dwellers who want to be able to afford rent AND food but also want to be able to move around their space. This is more difficult than you think. Try having a dinner party with 6 people and 2 chairs, it just ain't happening. ANYWAY, this piece of furniture is supposed to store a lot of your stuff (bed, desk, etc) and be mobile so you can push it around your apartment to where you need. 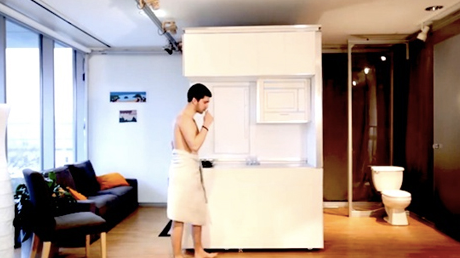 This is awesome, unfortunately it wouldn't work in mine - NYC apartments tend to be long and skinny (so do the bars) and roomy, boxy apartments (aka FRIENDS) are hard to come by. I highly encourage you to watch the video, the dance party at the end is my favorite. Also, you may feel like getting this just to pretend you are a wizard. You can stand under my umbrell.. bike?